The Moza Air 2 for DSLRs and mirrorless cameras has promising features. But does it live up to expectations? Tanvi Dhulia reports. The Moza Air 2 by Gudsen is a feature-packed camera stabiliser which has a lot of positives. With a sleek and intelligent design, the gimbal takes some time to get accustomed to, but offers a lot of freedom in control and movement to achieve one’s creative vision. 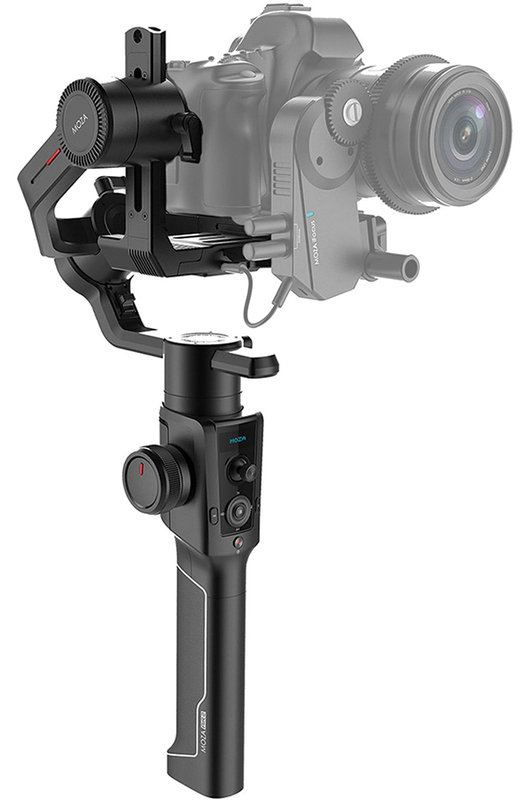 The three-axis gimbal weighs 1.6kg and has a payload range of 0.3-4.2kg, which makes it capable of supporting a wide range of camera and lens combinations, including relatively large DSLRs. It has a runtime of 16 hours, powered on its four Lithium-ion Polymer batteries, which are replaceable. It also has a convenient Manfrotto compatible quick-release plate. The Air 2 has a small, rectangular OLED screen on its body that allows one to view a menu and fine-tune controls, depending on their requirements. Its arms have visual markers of a scale to aid the balancing process, and plastic flip-like screws to adjust them. It has a 3/8 extension port on the back to attach the device to microphones, monitors and lights. It is also equipped to support Moza’s iFOCUS Lens Control System. It has eight types of follow modes, along with an Inception mode and a Sport Gear mode. It has an auto-tune feature which, when activated, shakes the camera along with different axis’ to get a sense of its weight, in order to determine how much power needs to be sent to the gimbal’s motor. This helps optimise the Air 2’s battery performance. The Moza Air 2 has a fairly sturdy body, made of metal and high grade plastic. It has a rubberised grip, which is welcome, especially considering how heavy the device is by itself. Due to its weight (and its capacity to uphold 4.2kg) it is ideal for larger and heavier cameras. This also means that it can be physically taxing to operate it for long durations. The Air 2 has a plastic dial and eight clickable controls right below its OLED screen, including its prominent power button. The joystick operates smoothly, and the trigger at the back of the gimbal (above the grip), which can be used to re-centre the camera, is conveniently placed so that one can access it while keeping their thumb ready on the joystick. The large and distinct dial wheel on the side of the device operates smoothly and can be used to focus the lens swiftly and easily (this function is only available with compatible cameras). A good thing about the Air 2 is that the roll arm does not get in the way of the camera screen, allowing an unobstructed view of the footage being documented at all times. It also makes it easier to smoothly transition into a low shot. 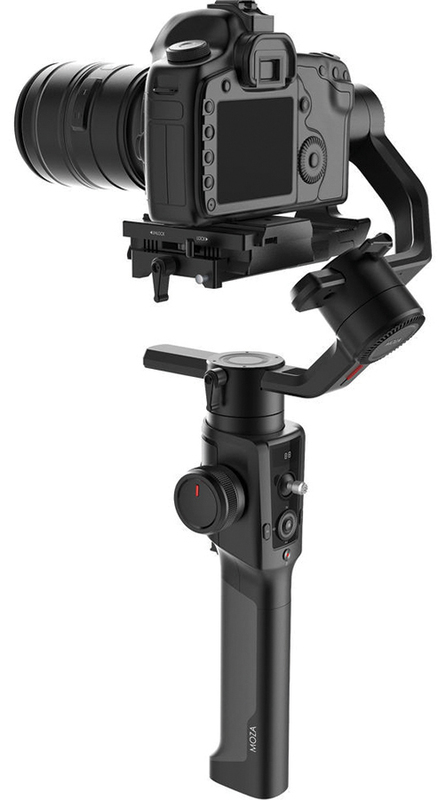 Furthermore, the gimbal allows one to follow and lock each axis independently, which makes way for a greater degree of control. One can also use the plastic dial to alter the speed at which the gimbal follows. It has two expansion ports at the bottom that give one the option to mount it on a tripod or monopod with ease. Its three-layer quick-release system allows one to unmount and re-mount the camera, without having to re-balance all over again. However, its battery case being located at the grip makes it a slightly awkward exercise to remove and re-insert them. Its all-black surface is prone to white scratches, most of which are deceptive and can be removed by running a piece of cloth over them. The Moza Air 2 has well-placed controls that can be accessed swiftly and easily during a continuous shot. The gimbal can take a little time to set up, and it is advisable to check the list of compatible cameras for optimal performance. While the Air 2 can be used without the variety of camera control cables, it comes in handy if one is fond of having additional control. The Air 2 meets industry standards with its performance. It offers smooth tracking movements, and using the joystick and menu on its body offers sufficient and convenient control options. One hardly needs the Moza Master app to operate it, and if you’re someone who prefers to shoot without interruptions, this is an aspect to consider. At Rs. 49,990, the Moza Air 2 is a worthy investment for videographers who prefer to have a greater degree of control over what they’re filming. The DJI Ronin-S, which offers some of the same features, has a maximum weight capacity of 3.6kg, and is currently available for Rs. 59,999. To those wondering whether they might face difficulty when the device requires servicing, Gudsen’s distribution partner has one service center in the country, which is located in Pune. Collection centers are available in all major cities.